I still have to scan in a couple images to talk about from a photography standpoint, so there’ll be even more on the Florida end. But right now, this is just a story. While The Girlfriend and I were down at Big Cypress Bend Boardwalk in the Everglades, we had started out on the trail into the swamp, but didn’t get very far before coming to a group of people halted on the trail. The reason for this was an alligator, maybe a little over 1.5 meters (4-5 feet) had hoisted itself up onto the trail and laid down for a quick snooze. The trail was only about four meters (12 feet) wide at this point and it was well off to the side. But there are warnings posted throughout Florida about the speed and aggression of alligators, and of course, watching any number of TV programs will impress on you the ferocity of African crocodiles. So being discreet is a better trait than being casual or oblivious. Anyone that has spent any time around American Alligators, however, knows this is overblown for safety reasons. They not only tend not to care very much at all about anything when they’re not feeding, they’re actually a bit shy. 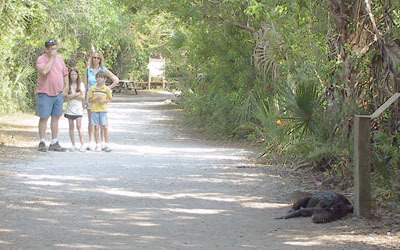 Gators that aren’t in areas where human contact is common often bolt for cover at the first signs of intrusion, but since nothing is big enough to tackle them, they’re often just seen sunning themselves and couldn’t care less about people in the area. The poor family on the far side of the trail from us, though, had a bigger problem. They couldn’t go anywhere until the gator moved, unless they decided to chance passing close to it. The Girlfriend and I had paused as well, but for my sake, I was more concerned about being in a park area and a ranger/authority figure being upset because I was not respecting the gator’s space. After a few minutes of this, however, I decided waiting for an alligator to finish napping could take 12 hours. So I unfolded the tripod to full length and held it out casually as a lance/polearm, then walked on the opposite side of the trail from the gator, stopped right alongside, and started waving people through behind me. I really didn’t feel the gator was any danger, but if he got seriously aggressive, he’d have the tripod to get through first. 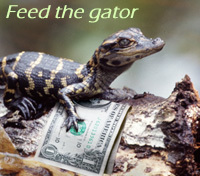 This wasn’t heroic, and not the point I’m making – it was more impatience, and knowing gators for what they are: lazy. But no one seemed to argue it, and took advantage of the path behind me to go on their way. The funny bit is, they often paused behind me to get a nice close photograph of the gator from the side. You see, I’m a big guy, and more than a meal for a smaller gator, and probably slower than most of the people around me, so this made a kind of sense. It didn’t go over well with The Girlfriend, and one woman got scolded by her husband for it too, but I hope at least they got their shots. Then the gator, well aware of my standing there, decided it had had enough of the paparazzi and hauled itself to its feet. I shifted to allow it room, and it ambled unhurriedly past me and down the trail towards the people who still hadn’t passed, who gave way respectfully. If it wasn’t for the one guy watching warily over his shoulder in this shot, you wouldn’t get the impression anyone considered this anything other than a photo opportunity. And this means that perhaps several people have shots of me getting this image from the other side. 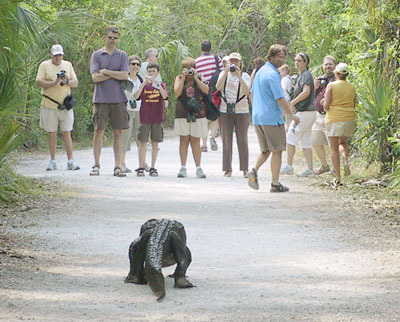 The gator, having navigated as much as six meters (20 feet) plopped itself down on the trail again, and I callously left the slowpokes to their own fate and continued down the trail. Part of me was already a little frustrated at the idea that I’d let a large group of people ahead of me on the trail all together, not the best move from a nature photography standpoint, because it means they’re much more likely to scare off anything of photographic interest. I’ll know better next time, and just skip through myself while the gator holds them off. I loved the cannon remote shutter project. I just bought an sxi, and wish I had gotten a better camera sooner. My venerable 35mm died about 25 years ago, and with all that was going on, couldn’t justify spending money to replace. EXTREMELY bad mistake!!!! I have been having a ball this past week getting to know my new toy! you might want to check out this “Double stroke switch” http://search.digikey.com/scripts/dksearch/dksus.dll?pname&site=us&lang=en&wt.mc_id=Dxn_US_US2010_Catlink&name=CKN9436CT-ND. I just ordered so I haven’t worked with it yet, but it seems just the ticket for a remote release! I was into procrastinating after procrastinating was cool.